Joseph was born in the Wallowa Valley in northeastern Oregon in 1840. His tribe was called the “Nez Perce”by French fur traders. They called them Nez Perce, which meant “pierced nose,” because some of them wore seashells in their noses. Lewis and Clark were some of the first white people to enter Nez Perce territory. The Nez Perce fed them and gave them shelter. Throughout Josephs life new white settlers had encroached on Nez Perce territory. Then in 1853, when Joseph was 23, his people were forced to give up what little land they had and settle on the Lapwai Reservation. However, he and many of the other chiefs refused. For the next 20 years they lived outside of the reservation. During this entire time more and more settlers had moved on to their sacred land. Then finally in 1875 President Grant proclaimed the Wallowa Valley officially open to white homesteaders. In May 1877, Brigadier General Oliver Gus Howard ordered his troops into the Wallowa Valley. They gave the Nez Perce 30 days to collect what they owned and move on to the Lapwai Reservation. The Nez Perce had no choice but to comply. Howard and his men were heavily armed with Gatling guns and howitzers. However, many of the warriors would have nothing to do with it. Before long, at least 20 warriors escaped. They were intent on getting even, and it didn't take very long before 20 white settlers were killed during raids. Joseph was left with no other choice. The Nez Perce would have to fight. The first skirmish was called the Battle of White Bird Canyon. Seventy Nez Perce waited hidden in the rocks and ridges of the canyon walls. As the U.S. Cavalry approached they fired on the white flag that the Nez Perce were waving. To the soldiers surprise shots rang out and 33 soldiers died. This was the start of what historians call the Nez Perce War. The Nez Perce War lasted from June to October 1877. During that time they would be chased over 1,200 miles in their quest for freedom. They fought 13 battles and every time they managed to defeat the U.S. Army or fight them to a standstill. The Nez Perce never numbered more than 200 warriors, but over and over they manged to fight off a force that totaled over 2,000 men. Even more amazing is that they fled with cattle, 2,000 horses, and 450 women and children. On August 8, the Nez Perce were camped on the banks of Beaver Creek in Montana's Big Hole Valley when they were attacked by a large cavalry force led by Colonel John Gibbon. Gibbon attacked at dawn, catching many of the Indians asleep. Both sides fought the troops until standstill. At the end of the battle 89 Nez Perce were dead and 33 more soldiers, including almost all of the officers. Next, they were attacked by a force commanded by Colonel Nelson Miles. The Battle of Bear Paws lasted for five days. During this entire time the Indians were bombarded by cannon fire. Finally, General Miles and Howard convinced Chief Joseph to surrender. Afterward, they were moved from one reservation to another. Many died of malaria, and they were miserable. Then, in 1885, the Nez Perce were allowed to move to the Northwest. At this time only 268 Nez Perce remained. 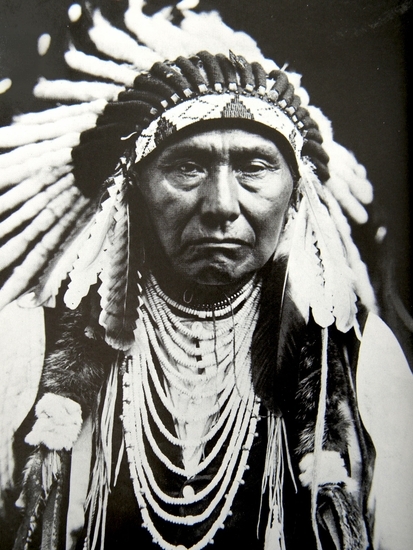 Joseph died in his tipi on September 21, 1904.